It concludes that if our ONDCP continues to make demand reduction its top strategic priority, then it must begin by reallocating resources from supply reduction to demand reduction programs. Download the PDF here: The Continued Standstill in Reducing Illicit Drug Use: Is the Policy-Budget Mismatch to Blame? The just released 2008 National Survey on Drug Use and Health shows what can happen when a drug policy fails to align program resources with its strategic goals and objectives. The Survey’s data reveal a troubling standstill in progress to reduce drug use with the overall rate of drug use remaining statistically unchanged during the 2002 to 2008 period. While there are many possible explanations for the ongoing stalled progress in reducing drug use, the most plausible one in this case may be the eight -year failure by the Office of National Drug Control Policy (ONDCP) to meaningfully match its federal drug control budget with the demand reduction goals set forth by its own policy. Simply put, the only way to reduce the demand for drugs is to pay for programs that do just that. In 2008 an estimated 20.1 million Americans aged 12 or older used illicit drugs on a past month (or current) basis. This estimate represents 8.0 percent of the population aged 12 or older. Statistically, it is unchanged since 2002 when it was 8.3 percent. Of these 20.1 million Americans, 15.2 million, or 76 percent, were current users of marijuana in 2008, continuing to make it the most commonly used illicit drug. The rate of past month use of marijuana among people 12 or older in 2008 was 6.1 percent, unchanged from 2007 (5.8 percent). In fact, this rate has not changed since 2002. The good news in this year’s Survey is that there was a one-year decline in current non-medical use of prescription drugs. An estimated 6.2 million people in 2008 used these drugs; down 10 percent from 6.9 million in 2007. Past month use of crack cocaine and methamphetamine also declined between 2007 and 2008; rates of use for each of these drugs fell 41 percent, from 610,000 to 359,000 and from 529,000 to 314,000, respectively. Current illicit drug use remained stable from 2007 to 2008 among youths aged 12 to 17. A total of 9.3 percent of youths aged 12 to 17 were current illicit drug users , 6.7 percent used marijuana, and 2.9 percent engaged in non-medical use of prescription-type psychotherapeutics. From 2002 to 2008, the rate of current illicit drug use among youths decreased by 20 percent from 11.6 percent to 9.3 percent. However, in reality, the decline in youth drug use actually ended in 2004 and the trend has been flat since then. Within this age group, the Survey continues to show that rates of drug use increase as youth age. Rates of illicit drug use in 2008 increased from 3.3 percent at ages 12 or 13, to 8.6 percent at ages 14 or 15, to 15.2 percent at ages 16 or 17. With regard to attitudes about the dangers of drug use, considered by prevention researchers as predictors of changes in drug use, the perceived risk for smoking marijuana once or twice a week peaked in 2005 at 55.0 percent, but declined by a statistically significant 3 percent since then to 53.1 percent. Each day, about 8,000 individuals try an illicit drug for the first time. This translates into about 2.9 million new users on an annual basis. Since 2002, the number of new users initiating an illicit drug for the first time each year remained unchanged. In 2008, the majority of new users reported trying psychotherapeutics (2.2 million of these individuals tried pain relievers). Marijuana was the second most initiated drug with 2.2 million individuals reporting that they tried it for the first time within the past year. older in need of specialty treatment for an illicit drug problem was more, estimated to be 7.6 million (calculated to include the 7.0 million individuals above plus another 600,000 individuals who obtained treatment during the year the survey was administered but who did not meet the abuse or dependence criteria at the time of the interview). Only 1.2 million of these people (16 percent) received treatment at a specialty treatment facility (hospital inpatient, drug or alcohol rehabilitation, or mental health centers), suggesting that 6.4 million—most of those who needed treatment—did not get it. Again, the estimate of the number of people needing, but not receiving specialty treatment, is unchanged since 2002. Under the previous administration, ONDCP implemented a federal drug control budget that was at odds with its goal of reducing drug use. 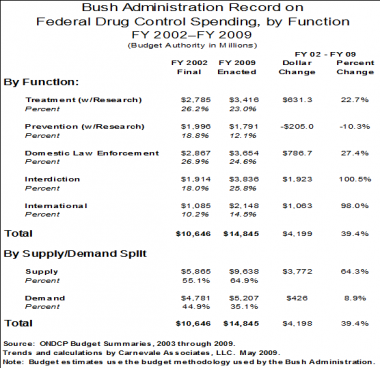 As the above table shows, total funding for drug control grew by 39 percent between 2002 and 2009, or by $4.2 billion dollars. A total of $3.8 billion of this increase, or 90 percent, funded supply reduction programs; most of this increase went to interdiction (programs that seek to stop drugs from entering the nation) and overseas programs (such as programs that seek to eradicate crops). By comparison, few resources were added for demand reduction programs. Of the total $4.2 billion increase since 2002, $0.4 billion, or 10 percent of this increase, went to demand reduction. In fact, resources provided for drug prevention were actually cut by $205 million, a 10 percent reduction since 2002. Research shows that treatment and prevention programs are very effective in reducing drug demand, saving lives, and lessening associated damaging health and crime consequences. It has also found that attacking drugs at their source—essentially eradication—is not effective. Nor has research shown that drug interdiction programs lessen the ability of drug traffickers to bring their product to the market. In reviewing this recent history relating policy and budget, one has to wonder why this research played an insignificant role in shaping the federal drug control budget. If research were our guide, then one would expect a more logical alignment between the demand reduction goals of the strategy and the budget to implement it. In other words, the budget should have emphasized demand reduction programming. Fixing the Federal Drug Budget: Priority Number 1? So far the Obama Administration, at least in its rhetoric, is emphasizing demand reduction and has stated that it is this nation’s demand for drugs that is at the heart of its domestic drug problem and the source of instability in other nations. One would therefore expect the new ONDCP Drug Control Strategy that will be released in February 2010 to emphasize demand reduction programs and include a corresponding budget to fund those programs. Clearly, if drug policy continues to emphasize demand reduction, then the take-away lesson of the past eight years is that success hinges critically on restructuring the federal drug budget. The lack of progress in reducing drug use since 2002 suggests that the concurrent doubling of funding for interdiction programs and for international programs was wasteful. The cut in prevention did not help matters either. If a repeat of history is to be avoided, this means adding more resources for prevention to stop drug use before it starts and preventing it from worsening if it does start. It also means adding more resources for treatment and recovery support services to reduce addiction. Finding funding to pay for a more common sense approach to drug policy will not be easy in these tough fiscal times. A first step in fixing the drug control budget will mean cutting all wasteful spending, especially for the expansion of supply reduction programs during this decade, and using those resources instead to offset the cost of expanding long under-funded critical demand reduction programs.